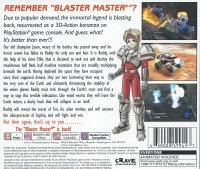 Box Text: Remember "Blaster Master"? Due to popular demand, the immortal legend is blasting back, resurrected as a 3D-Action bonanza on PlayStation game console. And guess what? It's better than ever!!! 10-06-2015 argyle Box Text Remember "Blaster Master"? Due to popular demand, the immortal legend is blasting back, resurrected as a 3D-Action bonanza on PlayStation game console. And guess what? It's better than ever!!! 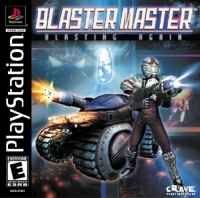 10-15-2012 empovyle Box Text Remember "Blaster MasterÂ®"? Due to popular demand, the immortal legend is blasting back, resurrected as a 3D-Action bonanza on PlayStationÂ® game console. And guess what? It's better than ever!!! 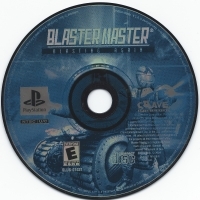 This is a list of VGCollect users who have Blaster Master: Blasting Again in their Collection. This is a list of VGCollect users who have Blaster Master: Blasting Again in their Sell List. This is a list of VGCollect users who have Blaster Master: Blasting Again in their Wish List.